He was born in Navaredok (Novogrudok), Byelorussia, into a distinguished family which included the celebrated Orientalist Avraham-Eliyahu Harkavy. His paternal grandfather was a rabbi in Navaredok, and his father Yoysef-Moyshe was a businessman who later abandoned commerce and made a living from watchmaking which he mastered on his own. Harkavy received a traditional Jewish education, though one of his teachers was a follower of the Jewish Enlightenment and taught his pupils Tanakh with Mendelssohn’s commentary. He studied Talmud in the local Talmud-Torah. When he was eleven years of age, his mother died, and he was subsequently raised by a great-uncle, Gershon Harkavy, and Gershon’s son Yankev who was later to become a well-known Russian Jewish journalist and a contributor to Voskhod (Sunrise), and from him the young Alexander acquired his first knowledge of Russia, German, arithmetic, and geometry, but he did not give up on Talmud. From his early childhood years, Harkavy demonstrated a knack for languages, and from a German-Syrian textbook that he found in Gershon’s home mastered Syrian. At age thirteen or fourteen, he began composing Hebrew poetry and articles in the florid style of the time. In 1878 he moved to Vilna, and there he studied for a time in a synagogue study hall, also perfecting his Hebrew grammar and Russian, while working at the Romm’s Publishing House as a letter polisher, later working as a bookkeeper and at night diligently devoted to self-study and to the study primarily of languages. He also began writing articles in Russian at that time. For a short period of time, he attended the Vilna school of design, for several months worked as a Hebrew teacher in Bialystok, then returned to Vilna to his former job, became an intimate of Ayzik-Meyer Dik, and also made his first ventures in the Yiddish language—with his poem “Al nehares bovl” (To the rivers of Babylon) and with the sketch “Kantorske stsenes” (Cantorial scenes). After the pogroms of 1881, he joined the “Am-olam” (Eternal people) [a group aimed at establishing agricultural colonies in the United States] movement, and with the second Am-olam group (under the guidance of Avrom Kaspe) departed for the United States in May 1882. When the plans of the group to establish in the “New World” a colony along communist principles came to naught and the group disintegrated, Harvavy took up arduous physical labor. He worked as a longshoreman at port, a dishwasher in a soup kitchen, and a farmer; he worked in a matzah-making factory for starvation wages, but none of this impeded his continuing study of languages. 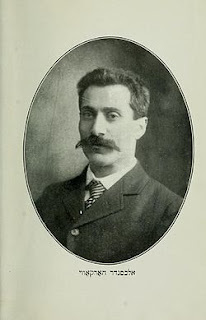 In 1885 he left for Paris and published there his first philological work in Hebrew, Sefat yehudit (Yiddish language), in which he offered a survey of the history of the Yiddish language and its grammar, and he demonstrated that Yiddish was a language like all languages of culture. The famed Jewish philologist Dr. Yisroel-Mikhl Rabinovitsh, who learned of Harkavy’s work in manuscript, wrote an article about it in the French journal Archives Izraelites (Jewish archives) on January 14, 1886, and advised the author to publish the work in German. Sefat yehudit remained unpublished, with only the first part thereof, entitled “Hayesh mishpat lashon lisefat yehudit?” (What is the language judgment on Yiddish? ), published in 1896 in Rozenberg’s Ner hamaarvi (The Western candle) and in book form (New York: Rozenberg, 1896), 24 pp. This booklet appeared in Yiddish translation by the author in Minikes yorbukh (Minikes’s annual) in 1906—the fourth part of the book, entitled “Obshtamung fun eynige idishe verter” (Root of certain Yiddish words), appeared earlier in Tsukunft (Future) in 1904. In 1886 Harkavy returned to the United States, and that year he published—as a “first booklet” of a “linguistic scholarly library”—a pamphlet entitled Di idish-daytshe shprakh (The Judeo-German language) (New York, 36 pp. ), in which “there are included the rules of Zhargon, which is needed by nearly half of the Jews, and it will be demonstrated that it is as good a language as all other languages.” In his foreword, the author noted: “This pamphlet is the first step I am taking in the literary world, and I am extremely happy about it; my joy is even greater, though, as it involves out mother tongue and that it is written in that language.” In 1887 Harkavy was invited to the society “Shaar hashamayim” (The gate of heaven) in Montreal to be a teacher of Hebrew in the local Hebrew Free School. In Montreal he made an attempt to publish a lithographic Yiddish newspaper (he himself printed the block letters for the lithographer): Di tsayt (The times), the first Yiddish newspaper in Canada, but only one issue of it appeared. Back in the United States, he began publishing (on June 15, 1890) in Baltimore the weekly newspaper Der yidisher progres (Jewish progress). From his long programmatic article in the first issue of the newspaper, one can see that the newspaper was to be progressive and aimed at spreading modern knowledge among the Jews, but because of opposition from conservative elements the newspaper was forced to cease publication with its ninth number. Historically, it was the first example of the use of phonetic orthography for Yiddish. Harkavy then settled in New York, where he was active over the course of four decades as a journalist, as a teacher, and—first and foremost—as the author of dozens of books which made him famous as a lexicographer and philologist. Aside from his literary activities, over the years 1904-1909 Harkavy was a representative of HIAS (Hebrew Immigrant Aid Society) in the general immigration bureau at Ellis Island, a lecturer in Yiddish for the Board of Education on the history, Constitution, and educational institutions of America (for the Jewish immigrants at Ellis Island), a lecturer for the Education Department of the Workmen’s Circle, and a lecturer on old Yiddish literature and grammar in the Jewish teacher’s seminary in New York (1919). On assignment from the Navaredok compatriot society in New York, he made a trip to the city of his birth in 1920 to carry out an aid project and with research objectives as well. He later wrote up his impressions from the trip in a series of articles for Forverts (Forward), as well as in the volume Navaredok, ir historye un ir hayntige lebn (Navaredok, its history and its contemporary life) (New York, 1921), 160 pp. In 1924 he spent a long stretch of time in Vienna, where his life’s work—the Yiddish-Hebrew-English dictionary—was being published at the time. Afterward, he also visited Israel. In 1926 he became chairman of the pedagogical council of the education committee at the Workmen’s Circle, was a member of the philological section of YIVO, and in 1928 on the occasion of the celebration of his sixty-fifth birthday he was elected an honorary member of American division of YIVO. His visited Europe in 1931 and was a guest of YIVO in Vilna. On May 6, 1933 his seventieth birthday was celebrated by the American division of YIVO in New York, and the entire Yiddish press dedicated articles in his honor. Harkavy published his writings on issues of the day as well as historical topics, and on Yiddish philological matters, in such venues as: Izraelitishe prese (Jewish press); Yudishe gazeten (Jewish gazette), including the essay “Poezye un reglen fun prozodye” (Poetry and norms of prosody) on April 11, 1897; A. Goldfaden’s Nyu yorker yudishe ilustrirte tsaytung (New York Jewish illustrated newspaper), writing under the pen name “Hipeus” such pieces as “Mikoyekh unzer shprakh” (Concerning our language) and “Klolim far yidisher oytografye” (Rules of Yiddish orthography) in 1888; Braslavski’s Nyu yorker yudishe folks tsaytung (New York Jewish people’s newspaper); Y. Yaffa’s Abend post (Evening mail), writing under the pen name “Berakhye ben Yoysef”; Teater zhurnal (Theater journal); Shomer’s Di natsyon (The people), including “Yidishe baladen in hebreish un yidish-daytsh” (Jewish ballads in Hebrew and Judeo-German), issue no. 1 (1901); Minikes yontef bleter (Minikes’s holiday pages); Fraye gezelshaft (Free society); Fraye arbeter shtime (Free voice of labor); Yidishes tageblat (Jewish daily newspaper), under the pen name “Freydes Kadesh”; Forverts; Tsukunft; Morgn zhurnal (Morning journal)—all in New York; Vintshevski’s Der emes (The truth) in Boston, including such pieces as “Goyishe nemen bay yidn” (Gentile names among Jews); and more. He also published feature pieces and letters from Canada, Paris, and a trip through the States in the newspapers. In Hebrew he published in: Hamagid (The preacher), Hamelits (The advocate), Hayom (Today), Hatsfira (The siren), Hapisga (The summit), Ner hamaarvi, and Haolam (The world). Harkavy also contributed to a number of English-Yiddish and English periodicals and one-time publications. And, aside from the aforementioned Di tsayt and Der yidisher progres, he also edited Yudish-amerikanisher folks-kalendar (Jewish American people’s calendar) (1894-1900), the monthly for scholarship, literature, and art; Der nayer gayst (The new spirit) (1897, writing under the pseudonym “Amerikanus”); Der tsvantsigster yorhundert (The twentieth century), an anthology (1900); as well as Avrom Khayim Rozenberg’s Yiddish translation of Johann Gustav Vogt’s twelve-volume Veltgeshikhte, fun uralte tsaytn biz hayntign tog (World history, from ancient times until the present day). Harkavy published a long series of textbooks and dictionaries of English, Hebrew, Russian, and Polish with Yiddish, such as: Der englisher lerer (The English teacher) (1891), 186 pp. ; Der englisher alef-beys (The English alphabet) (1892), 32 pp. ; Harkavis amerikaner brifn-shteler (Harkavy’s American letter-writing manual) (1892), 96 pp., which in subsequent editions grew to 315 pp. ; Olendorfs metode zikh grindlikh oystsulernen di englishe shprakh on a lerer (“Ollendorff’s method to acquire a thorough knowledge of the English language without the aid of a teacher”) (1893), 445 pp. ; English-yidishes verterbukh (English-Yiddish dictionary) (1893; sixth printing, 1910); Folshtendiges english-yudishes verterbukh, mit der oyssprakhe fun yeden vort in yudish (Complete English-Yiddish dictionary, with the pronunciation of every word in Yiddish) (1893); Yudish-englishes verterbukh (Yiddish-English dictionary) (1898); the two dictionaries, English-Yiddish and Yiddish-English, which went through numerous editions, were published together in 1898 by the Hebrew Publishing Company in New York and went through twenty-two editions, the last of them in 1957, with the English-Yiddish portion at 759 pp. and the Yiddish-English part coming in at 364 pp. Harkavy’s life work in the field was his Yidish-english-hebreish verterbukh (Yiddish-English-Hebrew dictionary) (first printing, 1925; fourth edition, 1957), 583 pp. in large format. He also worked on a Yiddish-Yiddish dictionary, but apparently never finished it; an extract from the planned “Yidish folks-verterbukh” (Jewish people’s dictionary) was published in Yivo-bleter (Pages from YIVO) 1.4 (1931) in Vilna. He also published in book form (in the series “Amerikana”): Kolumbus, di antdekung fun amerike (Columbus, the discovery of America) (1892), 32 pp. ; Vashington, der ershter prezident fun di fareyntigte shtatn (Washington, the first president of the United States) (1892), 32 pp. ; Konstitutsyon fun di fareynigte shtatn (Constitution of the United States), English text and Yiddish translation (1897), 84 pp. ; Der sitizen (The citizen), laws on naturalization in the States (1899; revised edition, 1922), 64 pp. He also published among other works: Navaredok (see above); Perakim meḥayai (Chapter from a life), autobiographical sketches (1935), 62 pp. In 1957 N. Mayzil translated Harkavy’s autobiography into Yiddish as Kapitlekh fun mayn lebn (Chapters from my life). All of these were published in New York. Harkavy also translated: from the Spanish original Miguel de Cervantes’s Geshikhte fun don kikhot (The story of Don Quixote [original: Don Quixote]) (New York, 1897), part 1, 583 pp; and from English, Professor Israel Friedlaender’s Idn in rusland un poyln, an iberblik iber zeyer geshikhte un kultur (Jews in Russia and Poland, a survey of their history and culture [original: The Jews of Russia and Poland: A Bird’s-Eye View of Their History and Culture]) (New York, 1920), 260 pp. He died in New York. Sources: Zalmen Reyzen, Leksikon, vol. 1 (with a bibliography); Yevreiskaya entsiklopediya (St. Petersburg), vol. 6 (with a bibliography); Jewish Encyclopedia (New York), vol. 4, p. 234; Universal Jewish Encyclopedia (New York), vol. 5, p. 216; S. Wininger, Grosse jüdische National-Biographie (Czernowitz, 1930), vol. 3, pp. 102; Harkavy’s autobiography (1903); Banket zhurnal (Banquet journal), published by the “Harkavi banket-komitet” (Harkavy banquet committee) (New York, 1926); Yivo-bleter (New York) 1.4 (1931), pp. 289-300; Yivo-bleter 6.1 (1934), pp. 1-4; Dr. Y. Shatski, Harkavis byo-biblyografye (Harkavy’s bio-bibliography), an accurate record of his longer and shorter works in book form and of a large number of his periodical publications, published by the jubilee committee of the American division of YIVO (New York, 1933), 18 pp. ; Yivo- biblyografye, vol. 1; A. Almi, Mentshn un ideyen (Men and ideas) (Warsaw, 1933); Y. Spivak, in Shikago (Chicago) (July 1933); Y. Ribkind, in Tsukunft (New York) (June 1933); K. Marmor, in Morgn-frayhayt (New York) (May 15, 1938); Y. Mark, in Tsukunft (January 1940); E. Shulman, in Hemshekh (New York) 2 (1940), pp. 102-6; Shmuel Niger, in Tsukunft (December 1940); A. Frumkin, In friling fun yidishn sotsyalizm (In the spring of Jewish socialism) (New York, 1943), see index; M. Ḥizkuni (Shtarkman), in Metsuda 7 (1954).